Carnegie Mellon University students participated in this year's Speak Up! Program, a five-part cross-disciplinary communication skills seminar for undergraduate summer researchers hosted by the Undergraduate Research Office. The program culminated in a July 13 event with public presentations modeled after the graduate-level Three Minute Thesis presentations. Sophie Halpern, a senior majoring in biological sciences, took first place in the presentation competition and Wyatt Swift-Ramirez, a senior Science and Humanities Scholar studying physics and chemistry, placed third. Junior biological sciences major Suraj Joshi was also a finalist. Stephanie Wallach, assistant vice provost for undergraduate education and head of the Undergraduate Research Office, spearheaded the Speak Up! series in collaboration with Kevin Monahan, director of the Career and Professional Development Center; Necia Werner, associate teaching professor in the Department of English; Nisha Shanmugaraj, associate director of Global Communications Center; and Richelle Bernazzoli, assistant director of the Undergraduate Research Office. "Speak Up! sessions ask students to consider how to tailor their messages to a broad range of audiences," Wallach said, "and to help students to think about adapting their resumes, their job conversations, their personal statements and their research presentations to these varied audiences and settings, from graduate school applications to job fairs." The Speak Up! sessions included Module 1-Deliver your Novelty; Module 2-First Impressions: Communicating Your Research "Sound Bite"; Module 3-Storytelling: Narrating Your Professional Experience in Personal Statements; and Module 4-Resumes: Your Calling Card to the World. Halpern's presentation focused on her summer project on extracellular matrix polymers in Candida albicans biofilms with Associate Professor Fred Lanni and Professor Aaron Mitchell. She said she learned to treat her presentation as a conversation, and when describing her research on fungal infections, to "make it as casual as possible." "[The program] set up very real-world scenarios that we can expect in our professional and personal lives when it comes to talking about our work," Halpern said. Halpern, like most of this summer's Speak Up! students, participated in the Summer Undergraduate Research Fellowship (SURF) program. 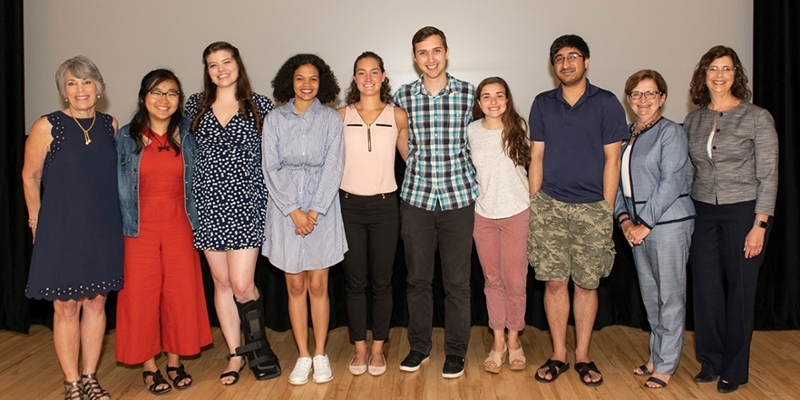 Undergraduates in the Dietrich College of Humanities and Social Sciences Honors Fellowship Program and the Summer Undergraduate Research Experience in the College of Engineering also took part. Other university offices involved in Speak Up! included the Global Communications Center and the Career and Professional Development Center. "It's hard to collaborate with others or engage people with your research if they can't understand what you're doing or why it matters," Werner said. "You miss out on the opportunity to get others excited about your work." Werner noted that after completing first-year writing courses, some students may not be exposed to this level of instruction in communication. Amy Burkert, vice provost for education, said Speak Up! helps students learn from each other — especially those outside of their major field. "It also helps students see that undergraduate research isn't just about learning the content of a discipline, but also helping them advance communication competencies in ways that serve them well in their research and other aspects of their professional careers," Burkert said. The SURF program is open to all majors and all levels of students. Speak Up! is a chance for STEM students to learn from their peers in the humanities, arts, and the social sciences and vice versa.